It's interesting to see how the number of models in Hamilton's lineup increased over time. I suppose some of that phenomenon was the result of technological advancements... if all you have are manual winding movements then you need X-number of models. When you add automatic movements, you need X+Y models. Now you have Electric movements so you need to have X+Y+Z models. 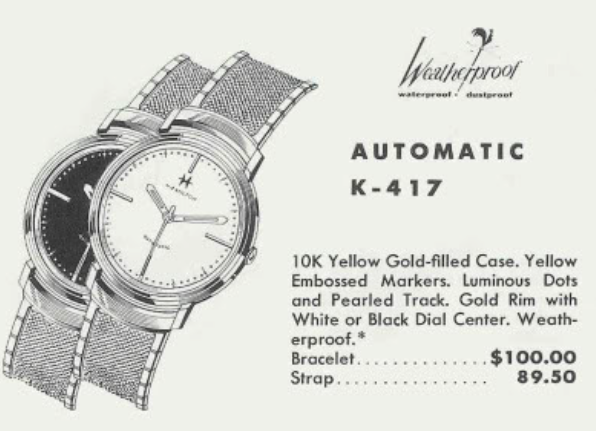 By 1969 there were over 200 models in Hamilton's men's watch line. When you add the ladies models into the mix, it's a ponderous array of complexity to maintain. I wonder to what extent the market tolerated such a diverse model line? Was there enough volume to justify the overhead of so many different designs? Would Hamilton executives have been better off focusing on fewer models and developing economies of scale? Not all models stuck around for long. 1960 had a number of one-year wonders, or watches made for a single year. One of them is the Automatic K-417. The K-417 came in a 10K yellow gold filled case. You had an option of a white radial finished or black dial. It came in a one piece weatherproof case with either a bracelet or a strap. Behind the dial is a Hamilton 667 movement. This Kurth Freres-based Swiss-made grade replaced the 661 movement used in previous K-series automatics. The two movements are very similar and share a lot of parts... best I can tell is the rotor shape is slightly different on the 667, otherwise they seem identical. Anyway, I was recently sent a K-417 project watch from one of my Hamilton collector friends. It's good to have friends with an interest the same as your own - as you get to live vicariously through them sometimes. As arrived, the watch was not running. The dial has an odd haze to it and is a mere shadow of what would have been a sparkly past. The case is engraved on the back with initials. They're a little hard to see here but they'll be much more visible once I polish the case. With the crystal lifted out of the way you can see that the dial is fairly complicated. There is a pearled track of small gold dots. Every 5 minutes there is a larger dot with luminous material and a line. The Hamilton H logo appears to be printed in gold. The hazy patina is probably the result of a failed lacquer finish. I could probably remove it but the odds would be extremely high that I'd lose the printing too. This is not a dial I'd like to try to get redone, so I will try to brighten it up with very gentle cleaning but nothing to significant beyond a quick rinse. The movement is very dirty, which explains why it's not running. Based on the rust on the female side of the two-piece stem I can safely say that moisture has gotten into this "weatherproof" case. Everything gets thoroughly cleaned and dried. It all looks to be in good shape so I'm optimistic the watch will run once I put it back together. The watch is bright and shiny now and although my camera has frozen it in time, the watch is ticking away with good motion. So it's off to the timer now. Not too bad... running just a little fast but everything else looks great. I can easily slow it down with a minor tweak to the regulator. There... over 24 hours this watch should be right on the money. Now I just have reinstall the dial and hands and put the oscillating weight back on. And here's the finished project, complete with it's original Kreisler bracelet. I had pretty good success with cleaning the dial up. It's not perfect but it looks a little better. I'm sure my friend will be pleased with the results, I know I am.